I'm not a big reader of Mommy blogs but one I've read since I started blogging is Scribbit: Motherhood in Alaska hosted by Michelle Mitchell. I've found Michelle's blog to be interesting and informative. 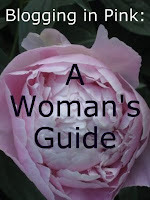 I've always liked her posts on blogging and recently she compiled them into a book called Blogging in Pink: A Woman's Guide. Blogging in Pink is a great beginner's guide to blogging. I really could have used something like this when I was just starting out. I had no idea what I was doing. Even though the book is aimed at beginners it does touch on topics for old-timey bloggers like myself. I did learn a few new things. Blogging in Pink is divided into 4 Parts with everything from Getting Started to Getting Noticed. It covers subjects such finding a blog hosting site, naming your blog, marketing your blog, advertising, and the technical do-hickies like Technorati and html. Michelle obviously treats her blog like a business so she has much information to share. She's been blogging for awhile so she knows the pitfalls of blogging like comparing yourself to others and blogger burnout. At 175 pages it's quick read, which is good for me because I hate reading large texts on the computer. I read it a few pages at a time over a few days. Some of the book is from posts from her blog but there is new material there too. It's written in Michelle's breezy conversational style that makes even the technical aspects easy to follow. Even though it's aimed at women, and especially Moms, there is something for everyone. Plus-pay attention people- it's free! Michelle has it on Scribbit in pdf format or you can buy it from Amazon for 80 cents for your Kindle. Highly recommended for beginning bloggers. I hope Michelle considers writing a more advanced guide in the future. Sounds great - I'll have to get a copy. Thanks so much for your plug--I really appreciate that. Boy a couple years go by fast. Hard to believe I've been hanging out at your place this long! sounds very worth while. Thanks. Wow thanks for telling me. I read Scribbit too but got so behind in reading posts I had to wipe clean most of April so I missed her post about her book. I hate reading on screen too but I plan on reading it! What's On TV, Or How Will I Survive Without Lost?